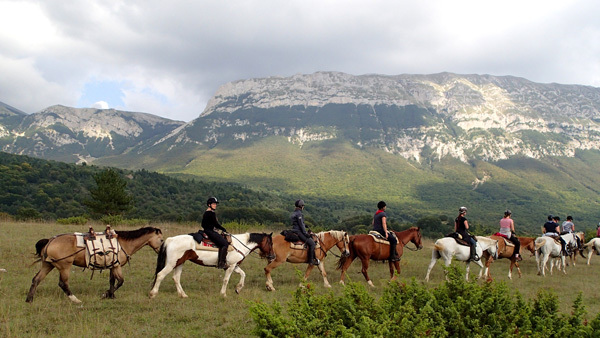 Trek through “Parco Nazionale della Majella" This National Park is the eighth so-called Pan Park in Europe. It is protected by WWF. 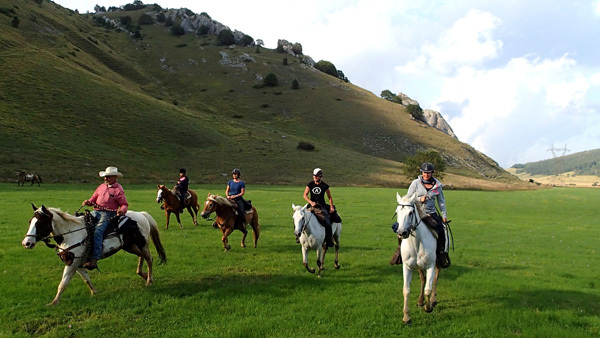 You will ride through increasingly high mountains and large stretches of valley. On the tablelands many canters will be made. The national park is centered on the Majella massif, whose highest peak is Monte Amaro (2,793 m). 7 nights, 5 ½ days ridning (6 -8 hours per day). Min. 6 persons and max. 8-10. The morning is yours. You may sleep late, take your time over breakfast, do whatever you like. Before lunch there is a safety-briefing. Then we groom and saddle up the horses, followed by a short demonstration in western riding. 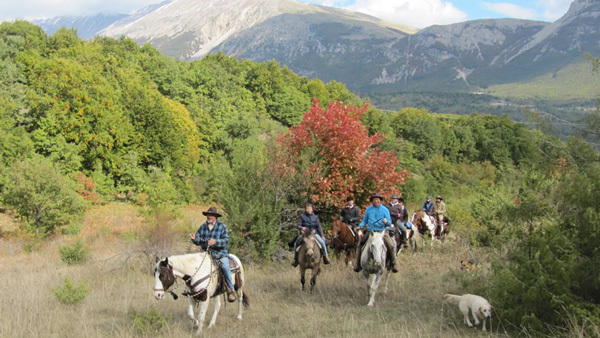 After lunch we do a test-ride (3 hours) to enable you to get acquainted with the horse you are going to ride on the trek. Dinner and BB are at the farm-house. You ride through large stretches of woods and fields and eventually stop for a picnic at an idyllic spot. After lunch you pass the remains of a Samnitic temple. The Samnites were the original population of Molise. It took the Romans three centuries of warfare before they finally conquered this region, which then became part of the Roman Empire (79 B.C.). Later you stop at a high hill from where you can see the Majella. At the end of the day you reach San Pietro Avellana. 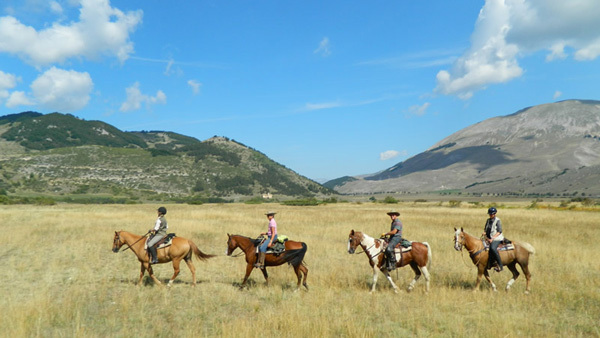 Here you leave the horses in a paddock and go by car at the agriturismo “Il Tratturo” were you dine and spend the night. Today’s destination is the small town of Pescocostanzo. The trail takes you through increasingly high mountains. At the end of the afternoon you ride through large stretches of valley. 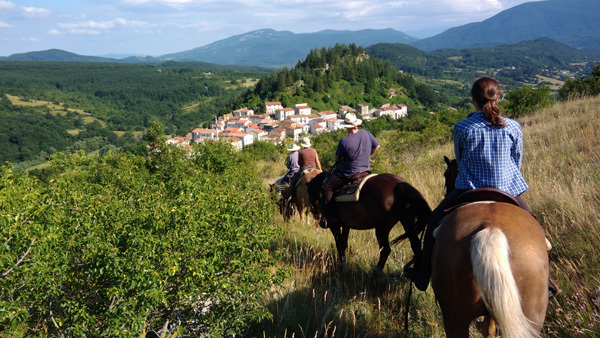 Having spent about 7 hours on horseback you are bound to be longing for a drink and fortunately Pescocostanzo has a nice square with several bars and restaurants. Taking a walk in this picturesque medieval town is pleasant for everyone and a must for those who are interested in architecture. You are staying at a small and cosy hotel. Dinner is at a restaurant. The National Park Majella (75.000 acres) is one of the biggest in Italy. It is a so-called Pan Park, which means that it is protected by WWF. Today there will be a 6 hours’ ride in surrounding highlands. It's expected that you will be able to have nice canters here. The night will be spent at the same hotel. Dinner, however, is at a different restaurant. This is going to be a demanding day spending about 8 hours in the saddle. The first part of the trail takes you upwards towards a large valley whereas the next stretch is a long forest road, leading us down and down again. Part of that road must be covered on foot! In the early evening you finally reach the destination. After leaving the horses in a paddock you go to Sandra riding centre were you have dinner and spend the night at his comfortable Hotel. Just outside Alfedena there is a plain where you can go for a long canter. A little later you pass Ponte della Zittola, which is the border between Abruzzi and Molise. Then you follow part of the Tratturo Castel di Sangro-Foggia in the foothills of Alto Molise. Having passed the hamlet Montalto it is time for a picnic. After lunch it takes four hours to ride home. About 6,30 p.m. you are back at the farm-house, unsaddle the horses for the last time and enjoy the farewell dinner.